A beauty having taken a bath wears a loose fitting yukata with a tenugui slung over one shoulder. She is about to brush her teeth. 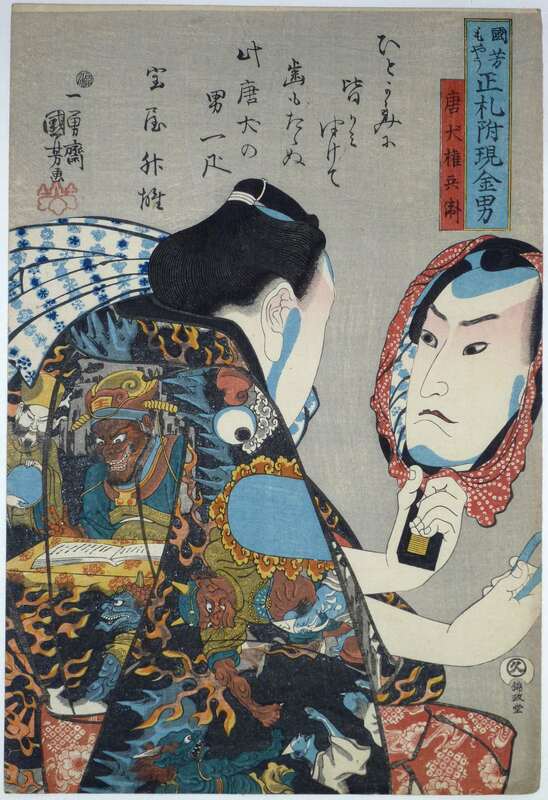 From Kuniyoshi’s finest set of fan prints. An untitled series of at least six designs showing young women in a state of dishabille at their toilette in front of mirrors, the corners partly concealed with cloth covers. Published c 1843-5 by Ibaya Sensaburo. For obvious reasons, uncut uchiwa-e are scarce. Indeed, this example might be unique. The other known prints from this rare set are: 1) A beauty powdering her face; 2) A beauty shaving her forehead; 3) A beauty suckling a child; 4) A beauty adjusting her hair with scissors; 5) A beauty playing with a cat. Very good impression and colour. Slight soil top and bottom right corners, otherwise good condition. Uncut. The rich blue grounds on this series have added mica. 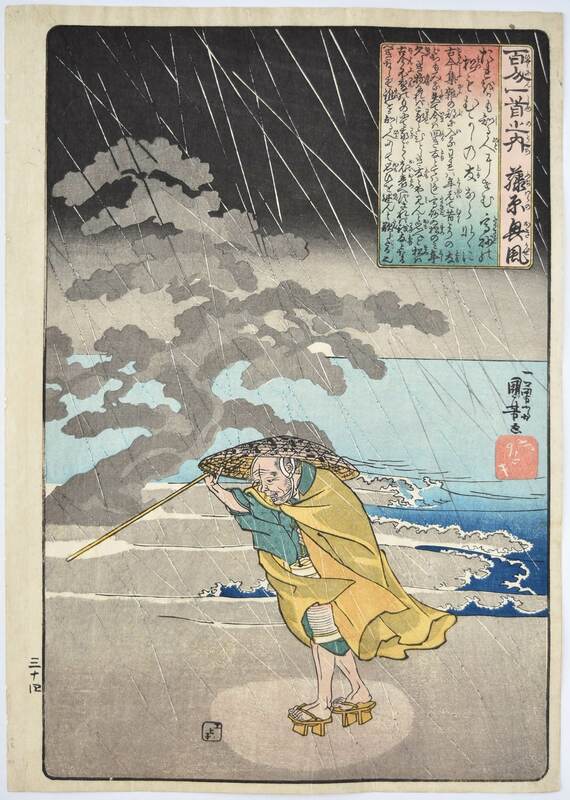 Signed Cho-o-ro Kuniyoshi ga.
A vertical diptych of a salt-water gatherer. These girls are often depicted in ukiyoe and seem to have held a fascination with the public akin to that for ama divers. Published by Jimpachi, c 1840. Very good impression and colour. Sheets separated. Minor signs of being mounted around edge, otherwise good condition. ( These vertical diptychs of this date and earlier were usually mounted onto inexpensive paper mounts. A poor man’s version of kakemono paintings. ) Signed Cho-o-ro Kuniyoshi ga.
A beauty in sumptuous clothing from a fine set of seventy numbered prints with title: Sankai medetai zu, “Excellences of Mountain and Sea.” The set compares busts of beautiful women with various products and occupations from the provinces of Japan. This is number 3, Tamba, and shows men fishing at night with the aid of flares. The set published 1852 by Sano-ya Kihei. Very fine impression and colour with strong burnishing on collar. Fine condition. 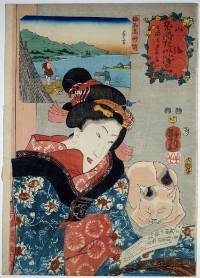 Signed Ichiyusai Kuniyoshi ga.
A beauty reading a program while a cat dozes beside her. 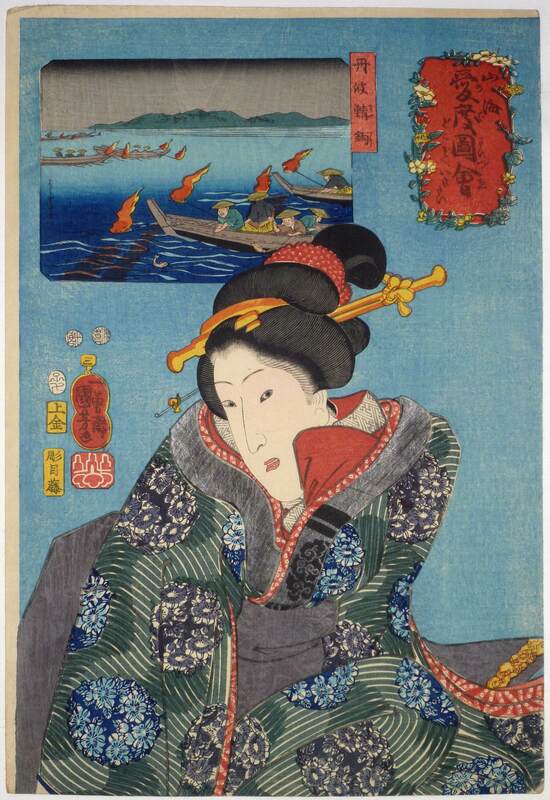 From a fine set of seventy numbered prints with title: Sankai medetai zu, “Excellences of Mountain and Sea.” The set compares busts of beautiful women with various products and occupations from the provinces of Japan. This is number 19. Catching octopuses, Takasago in Banshu [Harima] Province. The set published 1852 by Sano-ya Kihei. Very good impression and colour. The cat’s fur blind-printed. Light album backing, otherwise good condition. 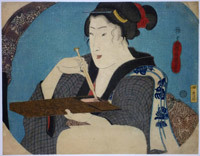 Signed Ichiyusai Kuniyoshi ga. Token Gonbei using a mirror to pluck his forehead (hitai). The style became known as Token hitai. 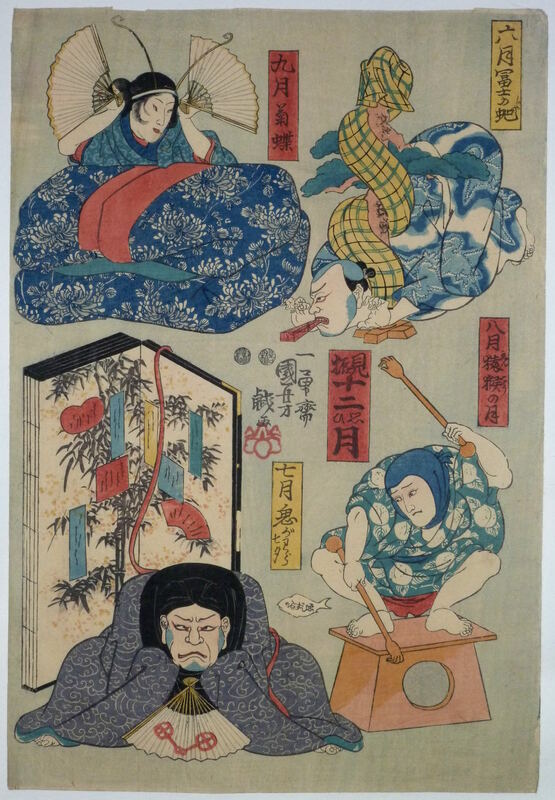 From a set: Kuniyoshi moyo shofuda tsuki genkin otoko, “Men of Ready Money with True Labels Attached, Kuniyoshi Style.” These otokodates (a word that is difficult to translate but was a chivalrous commoner, a fashionable man-about-town, street-wise and ready to assist the oppressed). Gonbei is said to have beaten a barking token (Dutch hunting dog) to death with his bare hands – thus he got his name. Published c 1845 by Iba-ya Kyubei. Very fine impression. Fine colour. Light album backing, otherwise fine condition. Signed Ichiyusai Kuniyoshi ga.
Sasai Kyuzo Masayasu (Sakai Kyuzo Narashige) enveloped in smoke and disintegrating before a volley of musketry at the battle of the Anegawa (1570). 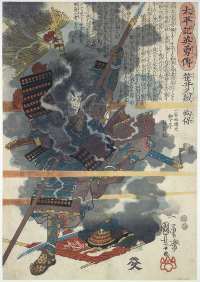 From the set Taiheiki yeiyuden, “Heroic Stories of the Taiheiki. A history of the wars of the loyalist Nitta and Kusunoki families against the Ashikaga war-lords during the second quarter of the fourteenth century. But in fact the subject of this set of fifty prints (this being 12, but not numbered) is the civil war of the late 16th century. Censorship restrictions imposed in the 1840s prevented publishers from illustrating historical subjects from the Tensho era 1573-92 onwards, so the publishers circumvented this by slightly altering the names of the historical figures. Published 1848-9 by Yamamoto-ya Heikichi. Robinson S62.36. The best design from the set. Fine early impression. Fine colour. Slight nibbling to left edge, otherwise very good condition. Fine impression. Fine colour. Slight trimming, otherwise very good condition. 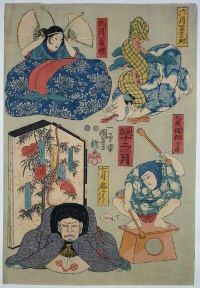 Signed Ichiyusai Kuniyoshi ga.
One print from a set of four with title Miburi juni omoi gatsu, “Gestures for the Twelve Months.” Each “gesture” or “caricature” is being performed by a Kabuki actor: So here the 6th month is Nakamura Tsuruzo imitating the serpent of Mt Fuji ( upper right ); 7th month is Otani Tomoemon IV as the gargoyle Onigawara ( lower left ); 8th month is Ichikawa Kuzo II as the turtle-like water sprite Enko ( lower right ); 9th month is Onoe Kikujiro II as the chrysanthemum butterfly. Published c 1847-48 by Ebisuya Shoshichi. Rare. A poem by the Heian waka poet Fujiwara no Okikaze , one of the Thirty-Six Immortals of poetry. 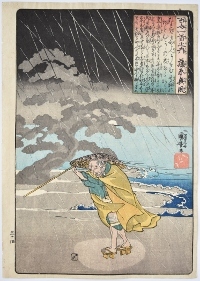 Shows the poet with a lantern walking along the shore of Takasago Bay past one of the famous pines, all in heavy rain. His famous poem refers to the pine. From a set Hyaku-nin isshu, “The Hundred Poets.” The series published by Yebi-Ne, 1840-2. Fine impression. (This appears to be the first edition with the pine printed lightly in two tones.) Fine colour and condition. Signed Ichiyusai Kuniyoshi ga.